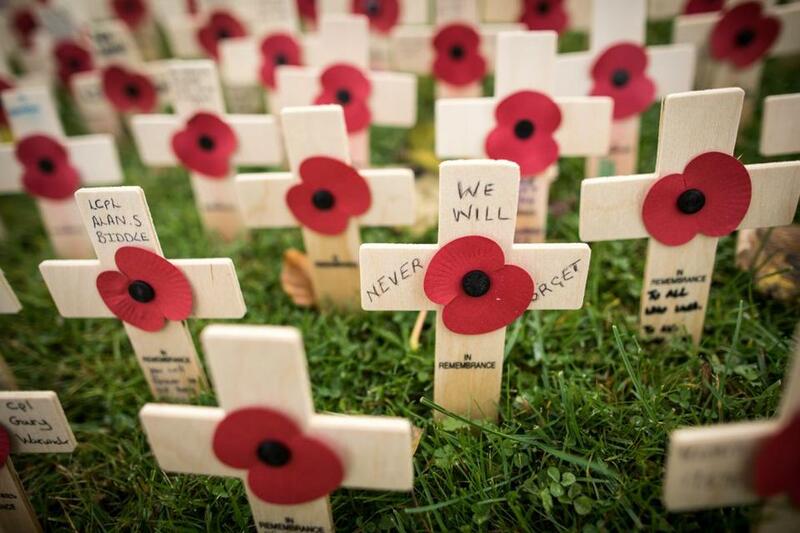 Poppies and crosses, commemorating the armistice ending World War I, are displayed at the official opening of the Field of Remembrance at Royal Wootton Bassett, in the grounds of Lydiard House and Park near Swindon, in Wiltshire, England, on Friday. To my generation, World War I was not quite history. My father’s father, John Ferguson, had joined up at the age of 17 and fought on the Western Front as a private in the Seaforth Highlanders. He was one of more than 6 million men from Great Britain who served. Of that number, 722,785 did not come back alive. Just under half of all those who lost their lives were aged between 16 and 24 — a fact that never fails to startle. John Ferguson was one of the lucky ones who made it home. But — like more than 1.6 million other servicemen — he did not return unscarred. He was shot through the shoulder by a German sniper. He survived a gas attack, though his lungs suffered permanent damage. My grandfather’s most vivid recollection of the war was of a German attack. As the enemy advanced, he and his comrades fixed bayonets and prepared for the order to go “over the top.” At the last moment, however, the command was given to another regiment. So heavy were the casualties in the ensuing engagement that my grandfather felt sure he would have died if it had been the Seaforths’ turn. As a schoolboy, reading the poetry of Wilfred Owen, learning to shoot an antiquated rifle in our school’s Combined Cadet Force, I could readily imagine the raw fear of awaiting that order. I wonder if my son knows that sensation. Orleans marked the 100th anniversary of the only enemy attack on American soil during World War I. 1. The war was not “for Civilisation,” as claimed on John Ferguson’s Victory Medal. It was a war for predominance between the six great European empires — the British, the French, and the Russian against the German, the Austrian, and the Ottoman — that broke out because all their leaders miscalculated that the costs of inaction would exceed the costs of a war. 2. The Germans were not doomed to lose. If the French had collapsed in the first six months of the war — when 528,000 French soldiers were permanently incapacitated — it could have been 1870 or 1940. French resilience was one of the surprises of the war. Even so, by mid-1917 the French were finished as an attacking force. German submarines were sinking frightening numbers of the ships supplying Britain. With Russia consumed by the revolution, American investors saw a German victory as possible as late as the spring of 1918. 3. True, the Germans were handicapped in multiple ways. Their allies were relatively weak: Austria-Hungary, Turkey, Bulgaria. Their leaders set unrealistic objectives that made a compromise peace impossible. Their generals used methods — submarine warfare, in particular — that made American intervention likely, if not inevitable. Economically, too, the German side was at a massive disadvantage. 4. However, the Germans were formidably superior at killing (or capturing) the other side. Overall, the Central Powers killed 35 percent more men than they lost, and their average cost of killing an enemy soldier was roughly one-third of the other side’s. The Germans were effective enough soldiers to win their war against Russia in 1917. 5. The Germans ultimately lost because the British Army proved more resilient than theirs. Men like John Ferguson simply would not give up, despite all the hardships they had to endure. Was it patriotism? Did they simply believe in the official war aims? Or was it because British propaganda was so effective — and British military justice so harsh? Perhaps all of these played a part. 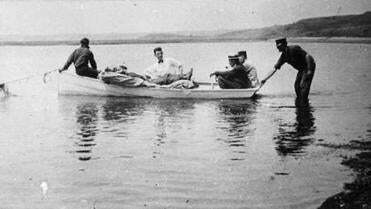 But it also mattered that British officers were generally competent; that the average Tommy’s lot was made bearable by plentiful “plonk” and “fags”; that, despite high casualties, the bonds between “pals” and “mates” endured. 6. The German army finally fell apart in the summer and autumn of 1918, after it became clear that British tenacity and American intervention made a German victory impossible, and after Bolshevik ideas began to spread westward from the Eastern Front. Beginning with the Battle of Amiens (August 7-8, 1918), the Germans lost the will to fight and began to surrender in droves. 9. The war was followed not by peace but by pandemonium. The dynasties toppled: Romanovs, Habsburgs, Hohenzollerns, Ottomans — all gone. Their great multi-ethnic empires also disintegrated. The Saxe-Coburgs survived by renaming themselves “Windsor,” but still lost the lion’s share of Ireland. Not only in Russia but all over the world, red revolution seemed unstoppable. To cap it all, an influenza pandemic struck, killing roughly four times as many people as the war had. 10. Not until the advent of a new generation of nationalist strongmen was it clear that belligerent nationalism was the best antidote to Leninism. Some called it fascism. But few of the interwar dictators regarded the peace treaties drawn up by the wars’ victors as legitimate. Most of the treaties were dead letters long before war resumed in 1939. Americans tend to forget World War I, though around two million men served in the American Expeditionary Forces. Today, if only for 60 seconds, just think of your grandfather or great-grandfather as a boy, in a trench, mortally afraid. And ponder how he got there.